An opportunity to duck out of work for an hour today, so I drove as far as Ballydavid pier. The sound from this river was amazing as it ran under the bridge and into the sea. 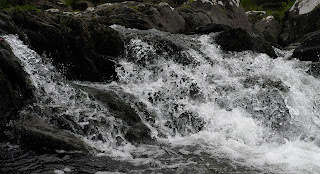 After some clambouring and some leaping I ended up dopwn at these rapids. I tried some slow exposure, but nice and all as they looked, they did sterilise the scene somewhat. A fast shutter was more in keeping with the scene.